The lower floor is accessed via a staircase from the ground floor. 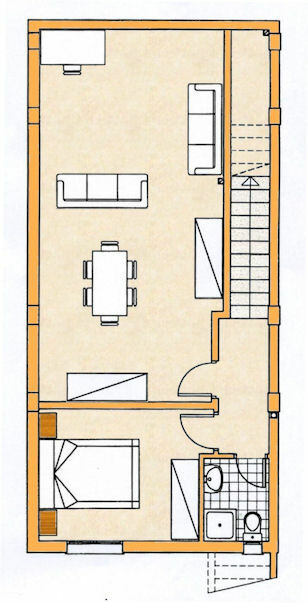 On the lower floor is a 3rd bedroom with double bed, wardrobe, bedside cabinets and chair. This bedroom has patio doors that open onto the large landscaped rear garden. 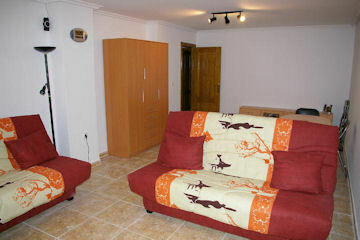 The very spacious underbuild room can be used as a TV/Games room or 4th bedroom and contains two sofa beds, wardrobe space and cabinets, table and chairs, computer desk and large wall mounted plasma TV. Also in the underbuild is a Personal Computer with broadband internet, Skype, and plenty of PC Games. 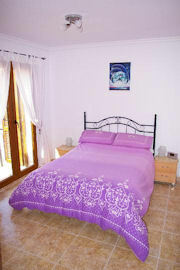 The lower floor also has its own toilet and shower room, great for privacy or when 2 families are sharing the villa.